2YO Racing Tips : Betting Strategy: Can You Defy the Odds of Being Eaten Alive? Betting Strategy: Can You Defy the Odds of Being Eaten Alive? So you like to bet. Everyone has their Modus Operandi. Well, they probably do even if they think they don't. A set way assessing which horse to bet. Even to the point of betting via traditional bookmakers or exchange. It is all too easy to think you are betting in a vacuum. If you bet online, use your iPhone, tablet or old-school and place your wager at Honest Joe's Turf Accountants. I wonder if some old dear has asked how much it would cost to plant a new lawn! Betting can feel that way, too. You place your bet as if somehow whatever you do it's a solitary act, no ripple from the pebble you throw. However, make no mistake, we live in a truly competitive world. Whether you back or lay, it is akin to swimming with a shoal of hungry piranhas. If your bet lacks cunning, understanding of the best way to swim the current, hiding places, it is only a matter of time before they sniff you out. When one bites at your toe, you need to have a master plan to eat the fish that's trying to eat you alive. If one gets a taste, you can guarantee plenty will follow until greedy mouthful by greedy mouthful you drop to the bottom of the tank, river or ocean of bets, a skeleton of wishful thinking, hopes and dreams. Your ultimate goal putting cold, hard cash in your pockets. With each and every bet, it is like someone somewhere, is watching your every move, anticipating your mistake. The collective shoal of piranha doesn't sleep. It smiles at itself in the mirror, using blood-red toothpaste and flosses its immaculate white teeth ready for its grub. If someone wants to take your bet you have to question why? When bookmakers are keen to take your bets they are fishing to see if you are a piranha, great white shark or an oily Dover sole. If you are the latter, they will welcome you like a long-lost friend. They may even invite you to one of their corporate dues at the races because you are a ''valued client''. You prop up the bar with a turbot, red snapper, cockney jellied eel and a smoked salmon who loves to chat up the girls. The story of most people's betting is very similar to a goldfish with a memory span of three seconds. Just long enough to see your horse cross the finishing line - unplaced - to forget long enough to place a bet that longterm is a lifelong loser. So many times people complain about betting as though it is a curse. Funny how people are only up in arms when they lose. In truth, gambling my tempt, be seen as the devil's work, but it is a problem of the person. Without discipline what isn't a potential problem? Alcohol, Anadin, Smoking or whatever fixation embeds itself like a glorious magic leech which at first soothed your mind then addled your brain. You may fancy yourself being a great white shark in a small pond. 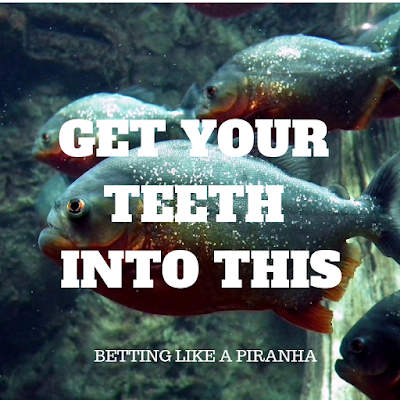 Those piranhas don't scare you. But when the sun gets hotter and the water begins to evaporate, those big teeth, power and attitude mean little as the mudskipper waves goodbye.